The Empty Stocking Fun benefits three cooperating agencies, Bradfield Community Center, Mizpah Community Center and the Salvation Army. 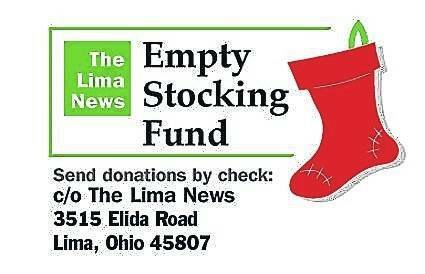 Money can be donated by sending it to The Lima News, 3515 Elida Road, Lima, OH, 45807, or by dropping it off at any Superior Credit Union Branch. Domations of new toys and nonperishable food items will be accepted at The Lima News office. These stories use assumed names to protect the participants’ privacy. See past stories at LimaOhio.com/tag.emptystocking. LIMA — Kayla is making a fresh start in Lima with her three children, Britney, 8, Hailey, 5, and Eric, 4, after escaping a three-year abusive relationship. Kayla said she wasn’t allowed to do anything without her boyfriend’s permission. She couldn’t make phone calls, go anywhere and couldn’t spend her own money she earned. He didn’t just control her either, she said. He was physically, verbally and mentally abusive to her, Kayla said, her eyes locking in the faraway gaze of someone reliving horrors no one should ever experience. She was living in the South at the time and hadn’t grown close to many people, she said. “I stayed in the relationship because he was the only person I knew who I was close to,” Kayla said. She had wanted to get out of the relationship for awhile but it took a tragedy to make her finally take action to leave. That was the moment she decided to leave him, she said. Her sister was gone. Kayla was still there. As was the man who refused to let her go out and watch her sister’s back. She has some family in Lima and someone she knew suggested a domestic violence shelter in the city. Her and the children are living in the shelter at this time, though she is getting an apartment soon, Kayla said. What her family needs this Christmas are household items for the apartment, she said. A table, rugs and furniture would be helpful, she said. The children need winter clothing and maybe a toy or two, she said. Britney wears a size 8-9 in shirts and pants and a size 4 shoe. Hailey wears size 5-6 in clothes and size 12 shoe. Eric wears a 6 in clothing and 12 in shoes. Britney and Hailey like Barbie dolls and other toys along those lines. Eric likes cars and other boy toys, Kayla said. This entry was tagged Empty Stocking Fund. Bookmark the permalink.